The amount of old electronics we throw in the bin is staggering, and now a new report from the United Nations University quantifies the extent to which we’re clogging our planet with discarded iPods and rusty washing machines. According to the report, people produced 41.8 million metric tonnes of e-waste in 2014. 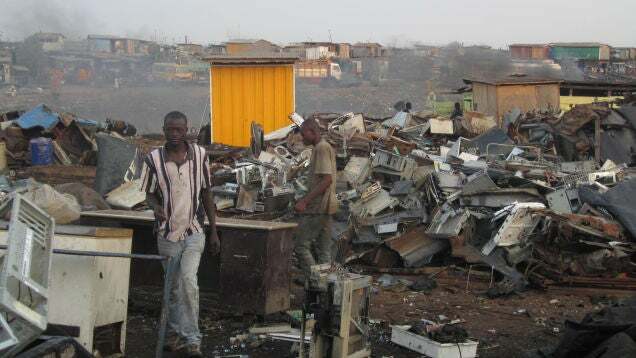 The UK alone contributed 1.5 million tonnes of e-waste, the sixth highest worldwide. And since approximately 15% of the e-waste produced is properly recycled through take-back programs, most of the electronic detritus gets dumped without meeting pollution and waste standards. The dumbing ground of Agbogbloshie, Ghana, is so polluted people refer to it as “Sodom and Gomorrah.” It’s one of the most striking places to see what happens when we don’t regulate waste—a wetland-turned-rubbishhell where people wade through the toxic smog of broken Androids and busted TVs to salvage valuable materials like gold.